The weather delivered to southern Wisconsin this week has ranged from warm and wet with thunderstorms on Monday to trees bent over, tired of the weight from the snow which fell after the bark was painted with freezing rain just yesterday. Today, the last day of January, we prepare for even worse. Temperatures will drop to the double digits below zero. The wind chill could near -30 degrees. What is going on? Mother nature is clearly pissed off at us. Humans. Terrible tenants who probably expect their entire security deposit returned when she kicks us the hell out of here. George Carlin said it best, "we are a bad case of fleas and mother earth is just going to shake us off." So true. And she should. Humans clearly are desensitized. We tend to respond to nothing less than a disaster. Time to drive less, bike more. Time to waste less and compost more. Time to show some f'in respect! 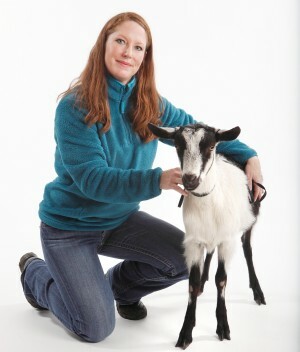 As always, I must mention our website, opiesgoats.com, where you can request info on our soaps and now lip balm too! It is so freaking cold lately. I cannot get warm, stay warm, feel warm, etc. I have space heaters, a fire, a wood-burner, and, at times, the oven/stove producing heat in this not-so-big house. I even brought Molly, my barn cat, in the house because I am convinced she must be cold and lonely. I feel bad for Angel too. 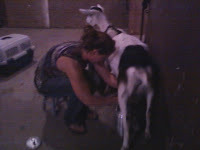 She was the last goat I had inside the barn. I recently dried her after milking for nearly two years. Anyhow, she was spoiled with a heat lamp and now I'm afraid she is too delicate to be outside. She seems to be waiting for me at all times which makes me anxious. The fact is, there is always something to worry about, rather, I always find something to worry about as I constantly project my feelings onto my critters. I ask out loud, "Are you cold? Are you hungry? Do you miss kitten-cat Molly?" Wowser! It is a cold one out today! I have been outside much of the day picking up branches and pine cones that covered the grounds after last night's wind storm. My cheeks can't seem to warm up but it feels pretty good to be active in such chilly weather. The goats don't seem to mind though - the sun is out and they invite the rays to take the iciness out of the air. I oftentimes see them laying out, like hairy sunbathers, napping with their eyes closed, chewing cud. As their caretaker, I have to keep in mind that when the temperature is under 37 degrees, livestock need more food and more water just to maintain their normal body temperatures.